In a striking pastiche of Trainspotting, Creativepool poked fun at the frustrations encountered in the industry everyday. Asking the industry to choose creativity, the shortlist is a spectacular collection of ideas, campaigns and people that chose fresh thinking, groundbreaking initiatives, incredible film, print and innovation in the face of mundane tasks of everyday work life. As a reflection of an industry that is becoming increasingly digital and to acknowledge the shift of in-house teams taking more prominence, the Annual 2018 shortlist features work from Greybox Creative Limited and many other brands and agencies around the world. With 27 categories shining a light onto the best creative work, a further 10 categories in the Annual 2018 award the people, teams and companies that bring creativity to the forefront. Creativepool is honouring the emerging talent, the leading influencers and the best brands and agencies with the much anticipated titles of Influencer of the Year, Newcomer of the Year, Agency of the Year and Brand Team of the Year. Creativepool will also acknowledge the Best Place to Work across Agencies, Brands, and Recruitment Agencies. Top level creatives and marketers from agencies and brands around the world make up the judging panel for the Creativepool Annual 2018. A collective rich in diversity and expertise, the judging panel spans 18 countries and four continents with panelists from Unilever, Ogilvy, eBay, Framestore, The Engine Group, Twitter, Sony Music, Interbrand, Publicis and more. Embracing the universality of creativity, Creativepool democratises its awards by enabling its entire online community to name a winner through an electrifying People’s Choice vote. The People’s Choice winners will be showcased alongside the judges winners in the Annual 2018. 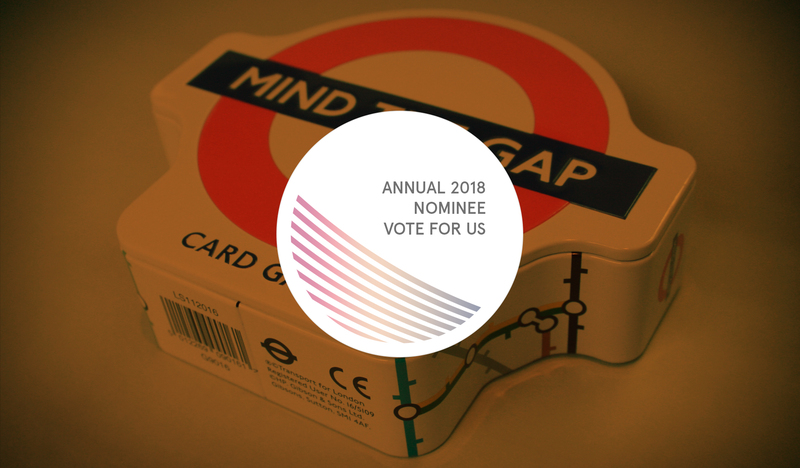 The People’s Choice voting is open until Friday 23rd February - 23:59GMT and you can vote for Greybox Creative Limited by simply hitting ‘vote’ under the project. Creativepool endeavours to set higher benchmarks for creativity and to inspire learning, interaction, and debate and does so with one of the most widely distributed creative award publications, the Creativepool Annual, Creativepool prints 7,500 beautifully bound copies of the Annual and puts them directly in the hands of industry leaders at brands and agencies, big and small, around the world, exponentially increasing the reach of the winning work, campaigns, people, companies and agencies. Creativepool is powered by connecting the global creative industry through discovery and inspiration. Specialising in bridging a gap in a vertical platform, our aim is to be the definitive way for companies to engage with the creative community. Our aim is to provide a place for you to find out what is happening in the industry, a place to gain insights from industry influencers, a place to be inspired by the work produced and by the people that produce it.